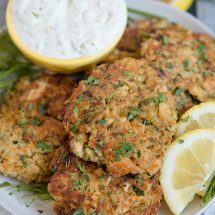 These Salmon Patties (aka salmon cakes) are tender and flaky on the inside, golden and crispy on the outside. 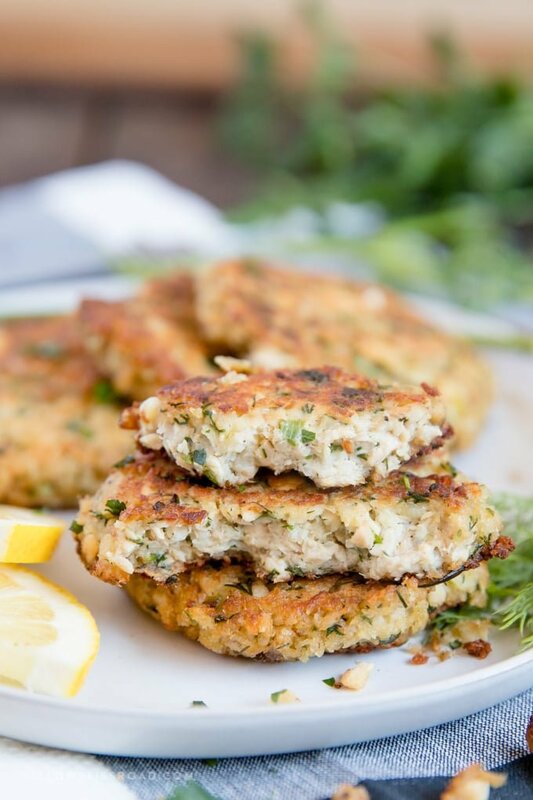 Made quick and easy with delicious canned salmon and fresh herbs, my salmon patty recipe will knock your socks off! If you had asked me a few years back if I like salmon patties you probably would have gotten a deer in the headlights kind of look. That just didn’t sound good to me, so it wasn’t something I’d ever tried. I finally worked up the courage (silly, I know) to try them, and I was immediately hooked and knew I needed to figure out how to make salmon patties at home. This recipe is pretty straightforward, and is similar to the way I make my homemade meatballs. Salmon Patties are crazy easy to make, and require little effort, making them perfect for busy weeknights. Mix ingredients, form patties with your hands, then fry them up on the stove. The whole process takes about 20 minutes from start to finish. 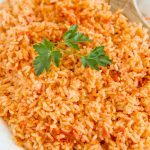 Start with canned salmon – I prefer to use the skinless and boneless kind, but as long as you get about 15 ounces, you can use any kind of canned salmon, or even fresh salmon that you bake in the oven. Next you’ll add fresh ingredients like dill, parsley, green onions and lemon, and some binders like breadcrumbs, egg and mayonnaise. All of these things mix together and for a delicious blend of flavors that enhance the salmon patties. I prefer to mix the ingredients with my hands to get them really well combined, then use an ice cream scoop for portioning so each salmon patty is about the same size, and use my hands to form the patties. 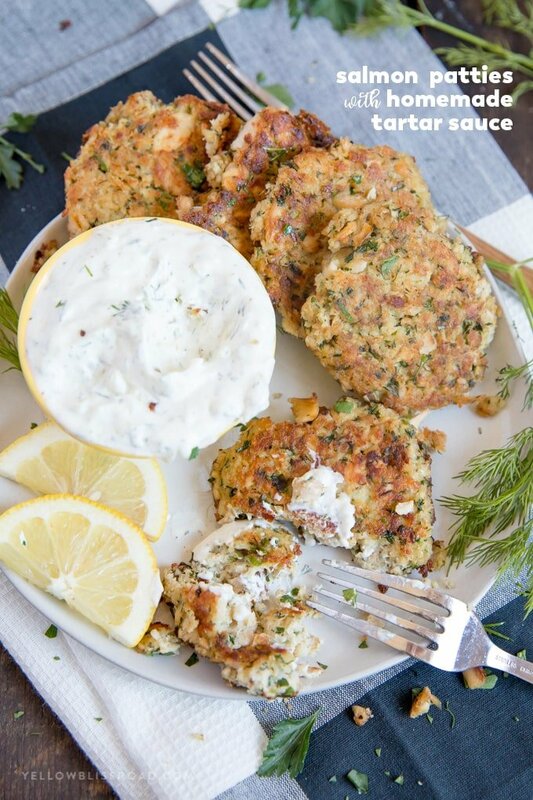 Fry them up in a skillet until golden and serve with homemade tartar sauce and lemon wedges! How long do salmon patties take to cook? 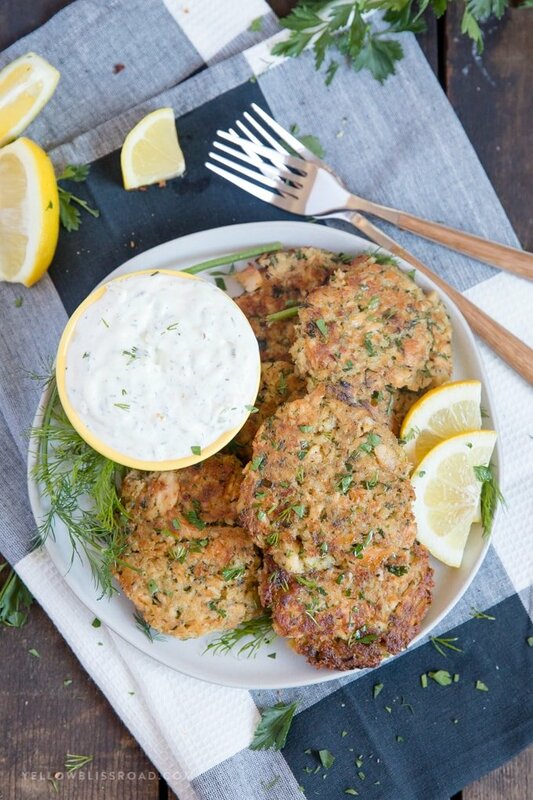 Salmon patties don’t take long at all to cook – about 8 minutes! Melt some butter and oil in a skillet and fry the patties about 3-4 minutes per side or until they are nice and golden. Have a paper towel lined tray or plate ready to transfer them to, them serve them up with some fresh lemon wedges or tartar sauce. Is salmon out of a can good for you? Fortunately, the canning process doesn’t take away the nutrients in fish, so you’ll get protein, heart healthy omega-3 fats and other nutrients from both fresh and canned sources of salmon. While there can be a slight difference in taste the ease of using canned fish in recipes like these salmon cakes or tuna pasta salad makes it a great option. 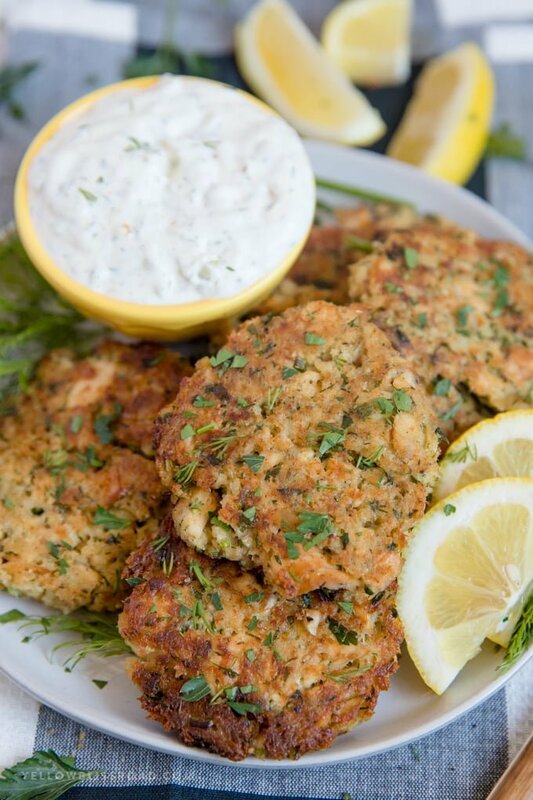 My entire family raved about these salmon cakes for days! 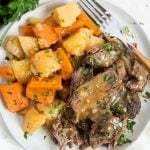 I served them with homemade tartar sauce, roasted potatoes and some steamed veggies, and I’ve since added them to our monthly dinner rotation. 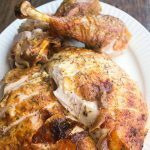 They are so tender and flaky on the inside, golden on the outside and the flavor is out of this world. 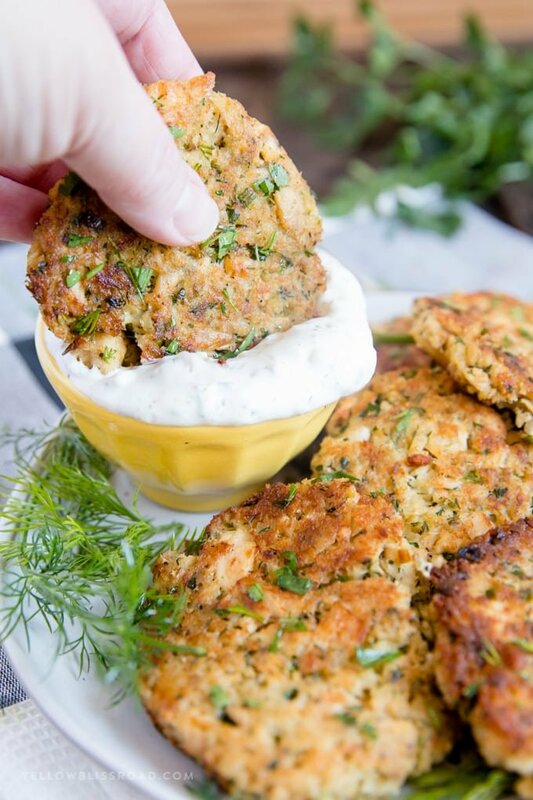 Give this salmon patty recipe a try and I bet your family will love them too! Here are some more delicious salmon recipes to try! Heat the butter and oil in a large skillet over medium-medium low heat. Add some of the patties to the hot skillet (don’t crowd the pan - you want at least an inch between patties). It it seems like the patties are browning too quickly, reduce the heat. 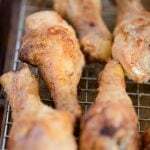 Cook 3-4 minutes per side, or until golden and crispy on both sides. Transfer to a paper towel lined plate to drain. Repeat until all patties are cooked through. Serve with homemade tartar sauce and lemon wedges on the side. If mixture is too moist to hold the patty shape, add more bread crumbs and if it is too dry, add an extra Tablespoon of mayo. They were great………………….I also added 2 teaspoons of honey and used corn meal instead of bread crumbs. Served with potatoes, corn on cob,steam veggies. Your recipe is by far the best. TYVM. Sounds like great additions Sandra! Delicious ! I added celery because I didn’t have Green onions. Are used white onions and the celery gave it some color. I also used 2 tablespoons of oil instead of butter and oil. Thank you Jill! and great idea on the additions. Thank you Helen! So glad you enjoyed it! 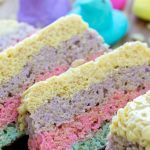 These were fabulous! And the dill sauce too. Thanks so much! Growing up i hated salmon patties. 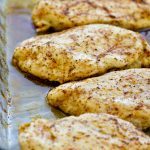 As a adult even just loosely following this recipe…… My husband and i are I love with how delicious they can be. 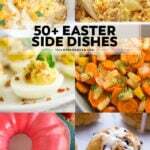 What side dishes do you serve with these? We like them with steamed rice and a crisp green salad. Very Tasty! I have always used my mothers old recipe, but decided to try this one to cut down on the salt because mom’s called for crushed saltines. I used garlic powder instead of garlic salt. I doubled the recipe and it was gone in 10 minutes between 3 people! Everyone loved it. Thank You! I made this recipe and they turned out great. These were delicious! I served them with a yogurt dill sauce. Thanks for the recipe. I don’t really care for salmon patties, but I eat them for my health. I add jalapenos to your recipe, then put provolone on the patties. This makes them much more palatable to me. These were delicious – and will be going in my regular meal rotation. 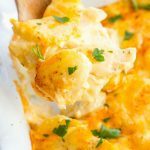 So much flavor and so easy to make!! Thank you!! Talk about yummy! Was missing my great grandmothers so I made these. They were so easy to make and turned out so delicious! Thanks a ton for such a great dinner addition. So planning on making mini versions to make fancy little appetizer bites! Awesome salmon patties, My wife said they were even better than the way her mom makes them. FYI, that is high praise. Thank you Kirstin for this site. I made the Salmon patties twice. They have been a favorite of mine and my family’s. Looking forward to more great recipes. Thank you Sydalia! and thanks for stopping by.